PASCAGOULA, Miss. --- The guided-missile destroyer USS Fitzgerald (DDG 62) took another step toward returning to the fleet as a fully ready, combat-capable ship. 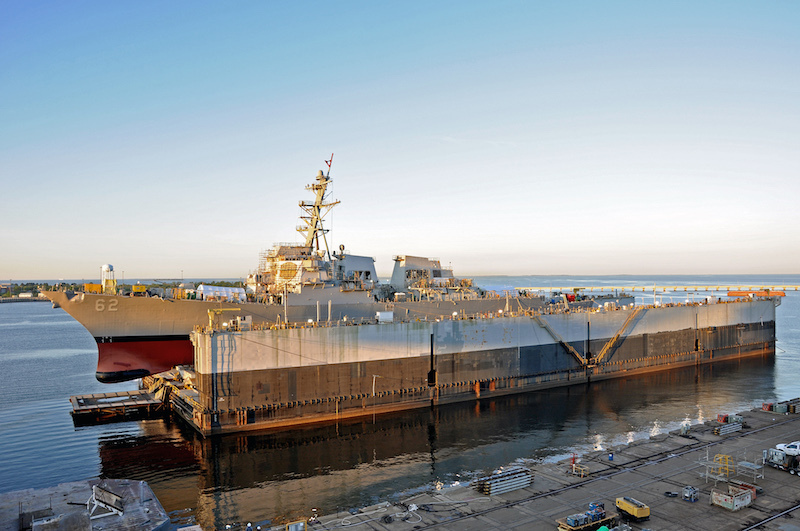 The ship achieved a milestone in its complex repair and restoration as it successfully launched and moored pier-side at Huntington Ingalls Industries (HII) - Ingalls Shipbuilding shipyard, April 16. The launch reflects more than a year's worth of effort in restoring and modernizing one of the U.S. Navy's most capable warships. Since the ship's arrival in Pascagoula in January 2018, work has focused on restoring the integrity of the hull and topside structures that were damaged during a collision in 2017 that claimed the lives of seven Sailors. "The complexity of this overhaul has been challenging, but our planning team at Bath Iron Works and waterfront team at HII is executing repairs and installing upgrades so that Fitzgerald returns to our Sailors lethal and mission-ready," said Rear Adm. Jim Downey, deputy commander for surface warfare and commander, Navy Regional Maintenance Center. "We're excited to have the ship back in the water where we can begin outfitting and testing efforts in support of getting the ship and crew back underway." To restore the impacted spaces to full operations and functionality, various Hull, Mechanical and Electrical (HM&E), Combat System (CS) and Command, Control, Communications, Computers and Intelligence (C5I) repairs are being conducted. These repairs range from partial to complete refurbishment of impacted spaces to replacement of equipment such as the radar and electronic warfare suite. The ship is also receiving HM&E, Combat System and C5I modernization upgrades. Due to the extent and complexity of the restoration, both repair and new construction procedures are being used to accomplish the restoration and modernization efforts. "This undocking is a step forward and brings us that much closer to getting Fitzgerald back out to sea - where the ship belongs," said Cmdr. Garrett Miller, Fitzgerald's commanding officer. "I'm proud of this crew's hard work over the past year and look forward returning to the fleet with enhanced warfighting capability and lethality." Throughout this restoration period, the U.S. Navy has made it a priority to ensure Fitzgerald returns to a peak state of warfighting readiness to contribute to an agile and dynamic fleet. Naval Sea Systems Command is the largest of the Navy's five systems commands. NAVSEA engineers, builds, buys and maintains the Navy's ships, submarines and combat systems to meet the fleet's current and future operational requirements.